The Hubbard Happenings: Happy 83rd Birthday Granddaddy Hal! Heidi and I went to Centreville to visit for Granddaddy Hal's 83rd Birthday! I, of course, forgot my camera. BUT I did capture this picture on my cellphone's camera. Hence the reason it is so fuzzy. :) Anyway Heidi really enjoyed seeing everyone. 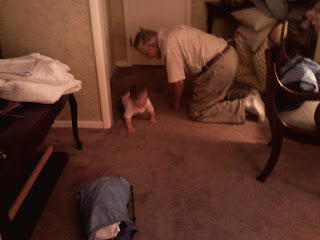 Especially Granddaddy Hal who decided he wanted to play too!